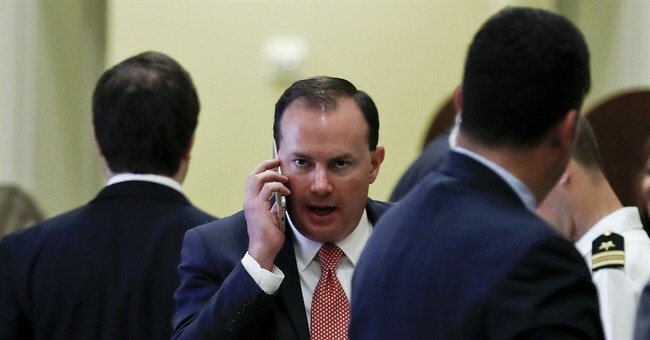 Senator Mike Lee (R-Utah) addressed the students at the National Conservative Student Convention Tuesday, calling them to fight for the principles of the Constitution. How to restore the Constitution to a place of prominence in our discourse? Storytelling. Lee spoke of the unsung minorities who contributed to the shaping of the Republic, who he recognizes in his book “Written Out of History.” Their history—the stories of women, and Native Americans, and minorities, are little known. But these people helped the direction of the Founding. An Iroquois chief, Canasatego taught Benjamin Franklin the “principle of federalism.” The Iroquois confederacy gave up some of their sovereignty for limited purposes, but protected the liberty of each tribe. Franklin told the other founders, and the concept shaped our nation's founding documents. People have forgotten what it means to have rights: “A right is not something the government must provide to you, a right is something the government can’t do to you,” Lee said to applause. To return, Americans must uphold their rights--since they will not uphold themselves. He recalled that while America enforced the limits and protected freedom spelled out in the Constitution for about a century and-a-half, but for the past 80 years, this has changed, we deviated, allowing government too much power. Because the lawmaking is delegated to people without the constitutional authority to enact laws, and they cannot be fired by the people, “We have a people living under a government not of their own creation,” he said. “This is very dangerous." And the cost-$2 trillion- is disproportionally on the shoulders of the poor middle class. Six of the wealthiest counties in the U.S. are suburbs of Washington D.C as another example of the accumulation of power.